I’ve long been admiring the beautiful blogs written by creative and stylish individuals for the “eye candy” and great information they provide. Being a designer and organizer, I’m always on the look out for innovative ideas and inspiration, and blogs certainly don’t disappoint. You can find blogs on just about anything, including the love of colour (House of Turquoise), entertaining (Reluctant Entertainer) and beach living (A Beach Cottage). With so much out there, why would I want to start a blog of my own? After hours of researching, writing, and designing details for the new website, I realized that, although there are thousands of decorating and design blogs, only a handful really tugged at my heart strings and formed a connection enticing me to come back for more. I’ve gravitated towards a few favourite blogs this year, such as Centsational Girl, Nesting Place and Arianna Belle. Not only are they beautiful, but also consistently offer lovely inspiration and practical tips for living better. I’ve found myself getting to know the writers of these blogs (Kate, Nester and Arianna) as they share their own transformations, revelations, and experiences related to stylish living. The blogs serve as a canvas of expression and a means to document each moment along the way. What may have started out as something small has grown in to a large following as each reader sees something she can relate to in each of these writers. Early this year it dawned on me that it was ridiculous to think I shouldn’t blog because so many people are already doing it. That would be like saying there isn’t a need for another book to be published. There will always be a story waiting to be written when the author is ready. Each and every one of us forms a connection with someone or something different. We don’t always know why, but it’s a feeling that draws us in. Perhaps my blog will be one of those you resonate with. It’s my hope that I build new relationships with each of you as well. As you follow, I promise to stay true to myself, all while growing, evolving and changing. I’ll do my best to inspire you to create the home and lifestyle you’ve always dreamed of. 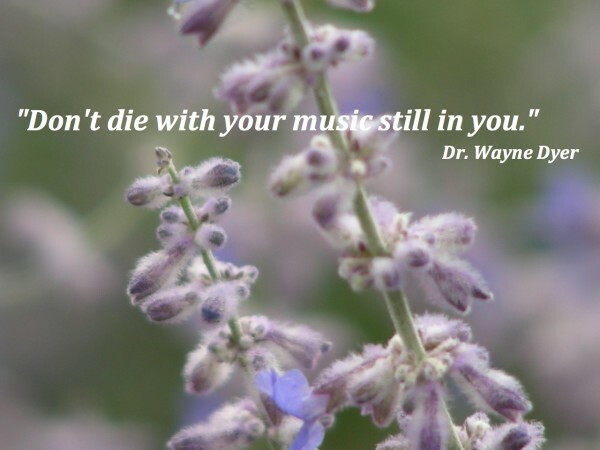 It’s my intention for this blog to be a tribute to Dr. Wayne Dyer’s quote: “Don’t die with your music still in you” as it pertains to the way I aspire to live my life and encourage you to do the same. So flattered you mentioned me and happy to see that you’ve decided to join the blogging community by starting your own blog! Looks great!! Thank you! Like you, organizing beautifully is something I love to do and sharing it with everyone makes me happy. I have just embarked on the same journey you are on. You have been my, Nesting Place, and an inspiration for me to share my music. I am an art teacher with an emphasis in graphic design, and have dabled in interior design and always been a diy-er. I enjoy writing and simple, real living and your blog is REAL. Keep sharing the music and writing your story, it inspires others to tell their too. Blessings on your journey, may it be fabulous! Thank you so much for your kind words! I am so happy to hear that my blog has been an inspiration to you and that it resonates with you. Blessings to you as well. I can’t wait to see how your blog evolves and I’m excited to be taking this journey with people like you. I am so fortunate! Hi Rita, Thank you so much for the kind comments. I recently came across your blog as well and love the inexpensive kitchen makeover you did a while back (voted for you too)! So great to connect with another Canadian blogger. Let’s keep in touch!